This is a popular subject and one we get asked about ALOT. 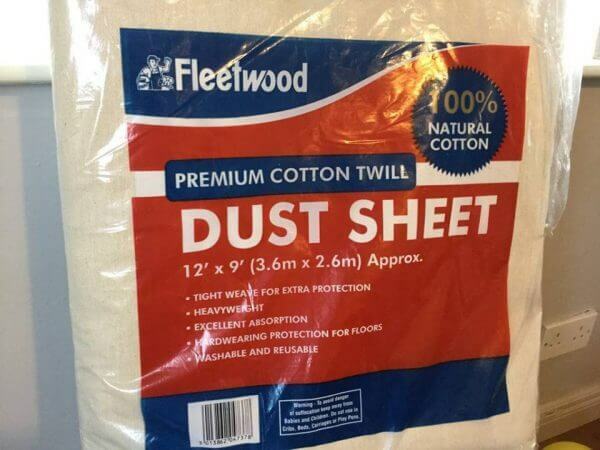 There are a good few laminate kitchens that could do with a little freshening up it seems as both myself and Fleetwood have received plenty of requests for this video and blog. 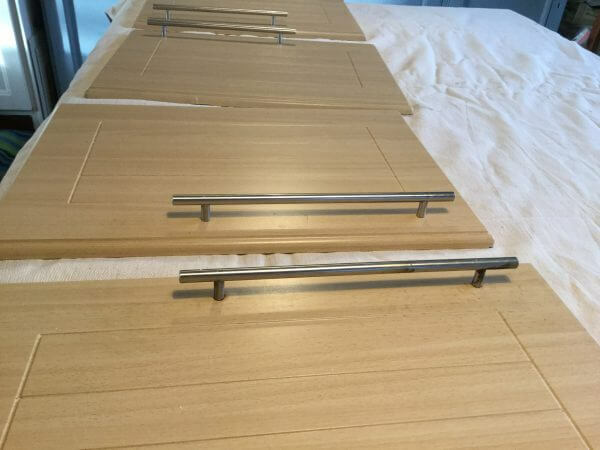 Is it possible to paint a laminate surface and if so do you need special products. The answer is yes and yes! 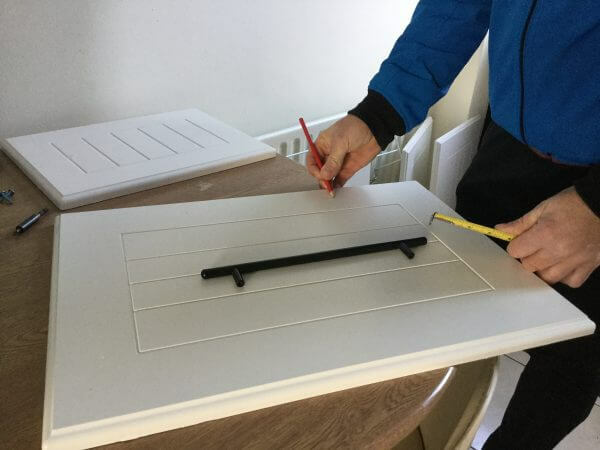 You can of course paint a laminate surface, but it can be one of those tricky ones as some products will simply not adhere well. Lets go through the video step by step. Let’s get the doors clean on both sides if you are painting both sides. 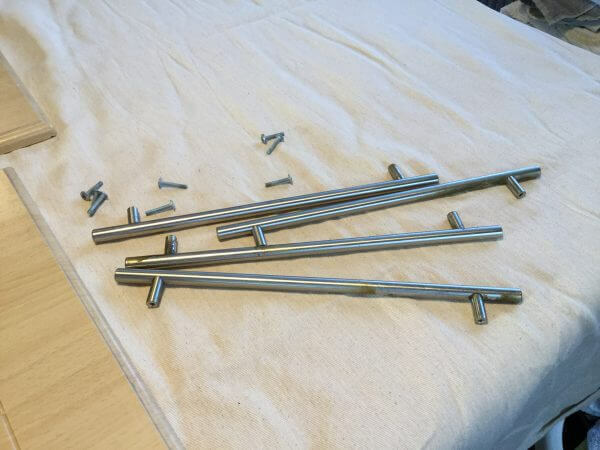 Grease and oil from kitchens can cause a paint finish to fail. I am only painting the outside of the door but I did use this opportunity to give the whole door a good clean. I don’t know about you, but that’s not something i get round to very often! 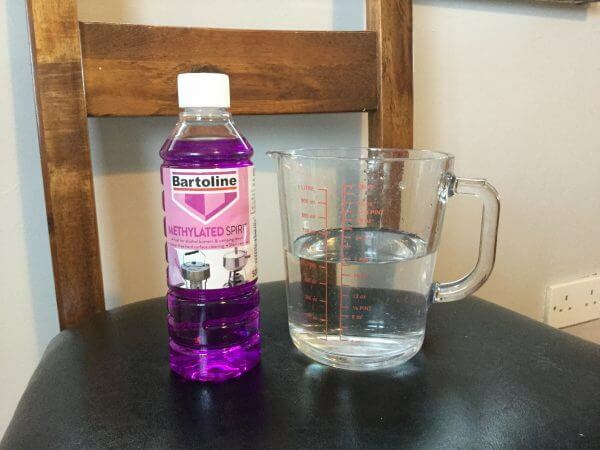 I use my favourite cleaner, a 50/50 mix of methylated spirits (denatured alcohol in the USA) and water in an old shower cleaner bottle. 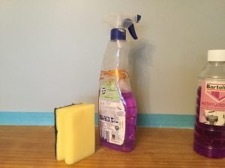 This is a fabulous cleaner because it will not leave any residue to bleed through your paint and it dries in minutes. To prepare a laminate surface you cannot dive in with a sander, this is not real wood folks and you will tear it to shreds! I simply got med grade sand paper and gave it a light scratching. This just dulls the shine and gives the primer something to adhere to. Now this is where you have to know what you are doing and buy the RIGHT primer. Why? Because the primer sticks to the laminate and then the paint sticks to the primer and we have a job well done. 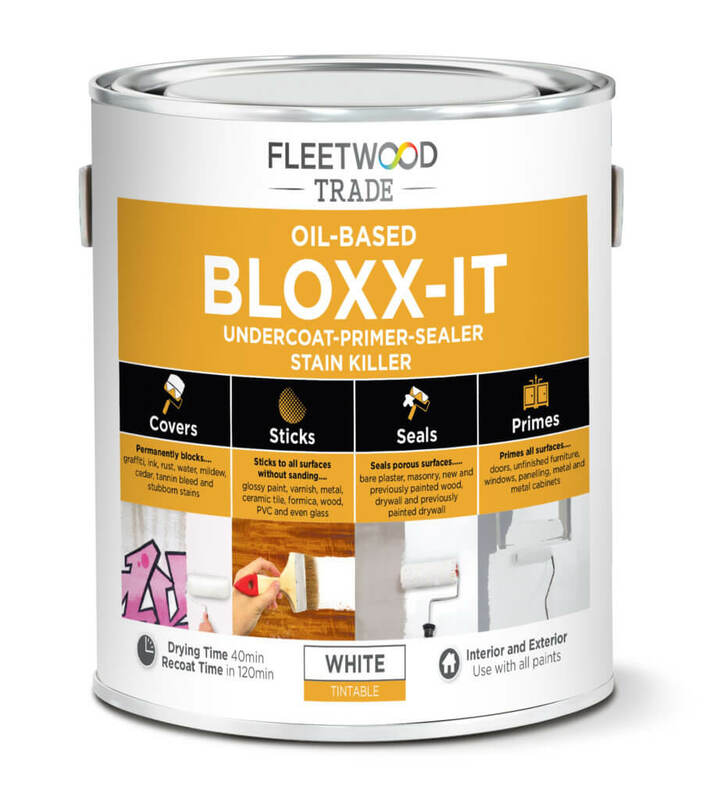 I used BLOXX-IT. It’s a primer that has super adhesion qualities and watch how I do the scratch test after rolling on this primer and letting it dry. This will tell you if you have a finish that will last or if you should stop now and not bother going any further. If your primer scratches off at this stage your paint finish will fail. Day 2: Scratch test! Ahhhh we all dread the scratch test don’t we?? ( just in case we didn’t do out prep properly.) 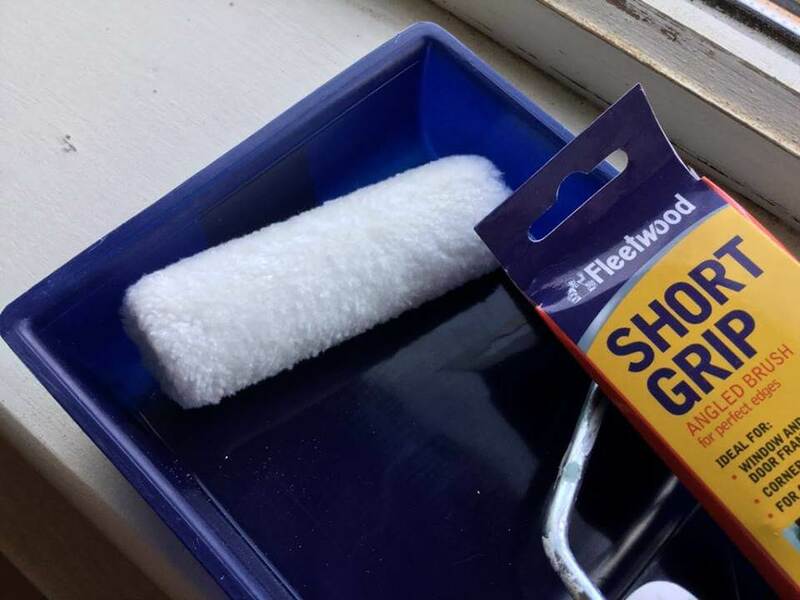 Well there isn’t much point in continuing if the primer didn’t adhere 路‍♀️ However, NO problem with adhesion when you use BLOXX IT… so I was ready to paint. 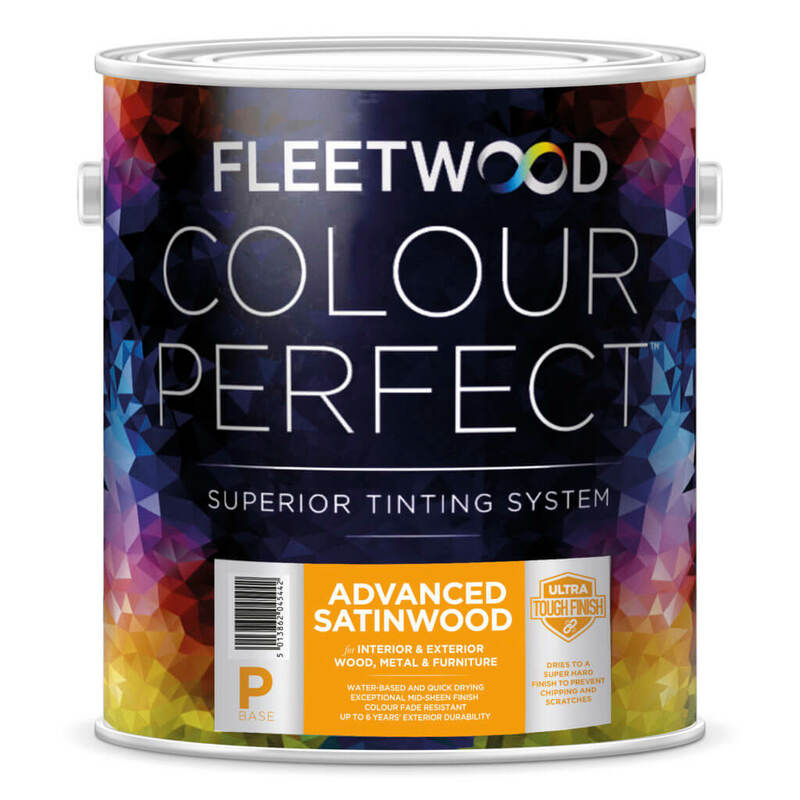 I chose the Advanced range of paint from Fleetwood and the finish I wanted was Advanced Satinwood as it’s a hard wearing, durable paint that can be washed down (you need that for a kitchen.) I applied it with the mini roller again and that gave me a spray-like factory finish. 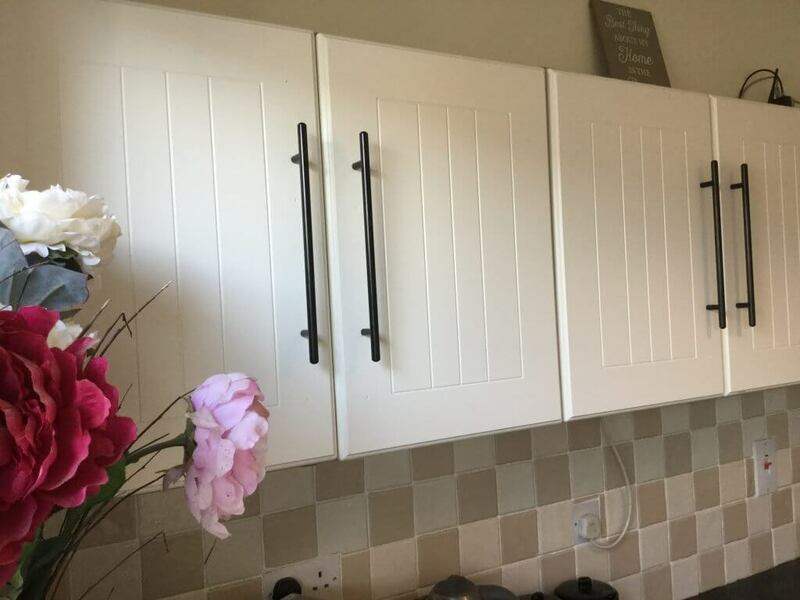 I had to fill in the holes for the handles in the end as the customer could only get slightly smaller ones so i used Fleetwood caulk filler… it’s amazingly smooth and easy to use. While the doors were drying I started work on the carcass. It was exactly the same process as you will see in the video. I cleaned, sanded and primed before rolling on the paint and once the carcass was done it really started to come together. Day three: Job complete I was done and dusted and had to then put the handles back on all the doors and re attach them! And what a difference in 3 days! The customer was thrilled. Have a go folks, it’s less expensive that buying a new kitchen! It is good to know a little about the paint you choose, so here are the advantages of the Advanced range.